Staff at a popular neighborhood sports bar and restaurant were using a pile of handheld IR remotes to manually control satellite receivers at each of the 18 TVs. Staff was frustrated with having to leave the bar to go change a channel, and customers were annoyed when it took too long or when they had to move so a remote could be aimed at a particular TV. The owner needed a solution that would solve the problem, but as a small business, any solution would also have to be affordable. 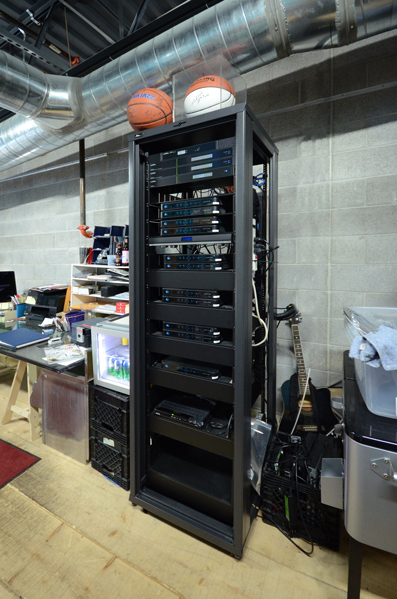 The integrator moved all the sources (14 satellite receivers and 2 cable boxes) to a central rack, installed Just Add Power HD-over-IP receivers and transmitters, and connected them to two stacked Luxul AMS-4424P AV Series managed switches. With instant switching, any of the sources can be displayed on any TV, while the RTI control system enables staff to easily operate the system from anywhere in the bar. Unlike more expensive traditional HD distribution platforms, this solution is cost-effective and easily expandable. 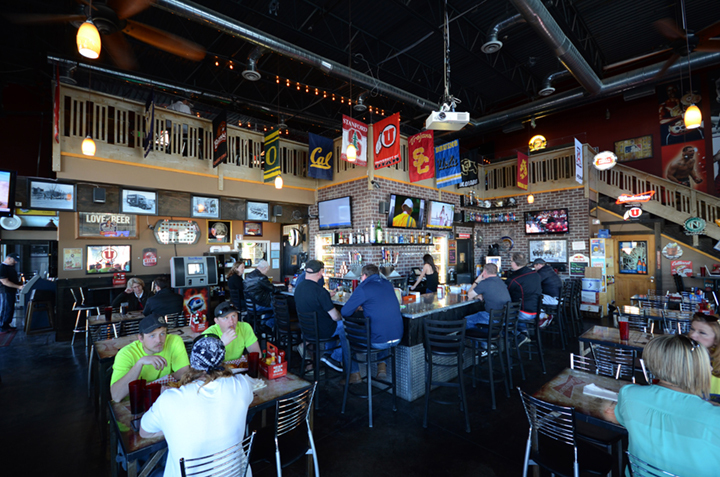 Opened in 2012, The Break Sports Grill is a popular sports bar and restaurant located in the trendy Daybreak neighborhood of South Jordan, Utah. Frequented by sports fans from all over the area, The Break is an entertainment oasis, with a patio, pool tables, shuffleboard, dartboards, and even a loft with a second bar. Owner James “Bam” Peck knew good food and cold drinks weren’t the only draw for a great customer experience. Sports fans love to watch a wide variety of live sporting events, too–so there are some 18 displays located around the establishment, while a 10-foot projection screen hangs in the corner, visible from almost anywhere in the establishment. Big corporate brands can afford large commercial systems, but the same isn’t often true for many neighborhood small businesses. They have to remain competitive, but they’re looking for any way possible to cut costs and be more profitable. Such was the case at The Break. To tackle The Break’s needs and still meet budgetary requirements, integrator Manny Perez turned to HD over IP using Just Add Power, Luxul and RTI. He relocated the satellite and cable receivers to a central rack and connected them to Just Add Power HD over IP transmitters. New Cat 6 runs were pulled to the displays where Just Add Power receivers were installed. Everything was then connected to two stacked Luxul AMS-4424P AV Series managed network switches. An RTI controller and iPads are used for system control. With the new system, staff can now control what’s playing on any display from anywhere in the bar. With instant switching using the RTI app on the iPad, any of the 16 sources can be displayed on any TV in the bar and Just Add Power’s ImagePull™ to see what’s on any display right from the remote control. Because the intuitive custom iPad app is the only interface needed, training is minimal and even new employees can easily use the system. The Break’s owner is considering leasing an adjoining space to expand and better accommodate busier weekend sporting events, so the system also needs to be expandable. The Just Add Power/ Luxul HD over IP system delivers scalability in spades. Traditionally, dedicated matrix switchers have been used for video distribution and switching. Matrix switchers are not scalable, which means that if you need even one more input or output than that supported by a particular model, a more expensive model is needed. Worse, if a customer’s needs ever exceed the capabilities of the installed matrix switcher, the switch will need to be completely replaced. On the other hand, HD over IP is scalable by design. When your customer needs additional inputs or outputs, it’s as simple as adding another transmitter and/or receiver, while ensuring there are sufficient switch ports to support the total number of inputs and outputs. Inputs can even be reconfigured as outputs! That’s the advantage of a scalable system: When your customer needs more inputs or outputs at any time, you don’t have to throw gear out and replace it. The Just Add Power/Luxul system installed in the Break can even be easily upgraded to accommodate 4K sources and displays, all without replacing any installed equipment! The advantages don’t just stop at cost, flexibility, and scalability. Just Add Power transmitters and receivers can be programmed to offer customers features previously only available in hardware costing significantly more. What could your customers do if their video distribution systems offered enhanced video wall functionality? What if video walls didn’t have to cost tens of thousands of dollars? What kinds of creative marketing could they do with features like scaling, rotated and flipped displays, logo overlays and more? With Just Add Power and Luxul, you and your customers have the answers to these questions and neighborhood businesses can now take advantage of technology that was once accessible only by the biggest corporate customers. Traditional matrix switching and signal distribution can be expensive and inflexible. As an integrator, you want a flexible solution that can grow as your customers’ needs change, and you want to be able to offer that solution to more customers. HD-over-IP offers scalability and flexibility at a price more customers can afford. With Just Add Power HD-over-IP and Luxul switches, access points, and routers, you can deliver the cost-effective, scalable video switching and distribution more of your customers need.